This was a breakthrough piece for me. I studied classical painting and drawing for a semester at Studio Escalier in Argenton, France, and realized on the last day that the professor gave me the same critique on my last piece that he had given the first day of class. Had I not absorbed anything during that semester?! But of course, I had. I had learned many things, most especially to slow down, to really observe what I was painting, instead of frantically trying to capture everything within a 2 hour figure pose. The more I looked, the more I could see. And if I could see it, I could paint it. How much do we miss in life because we don’t stop long enough to see all that is before our eyes? 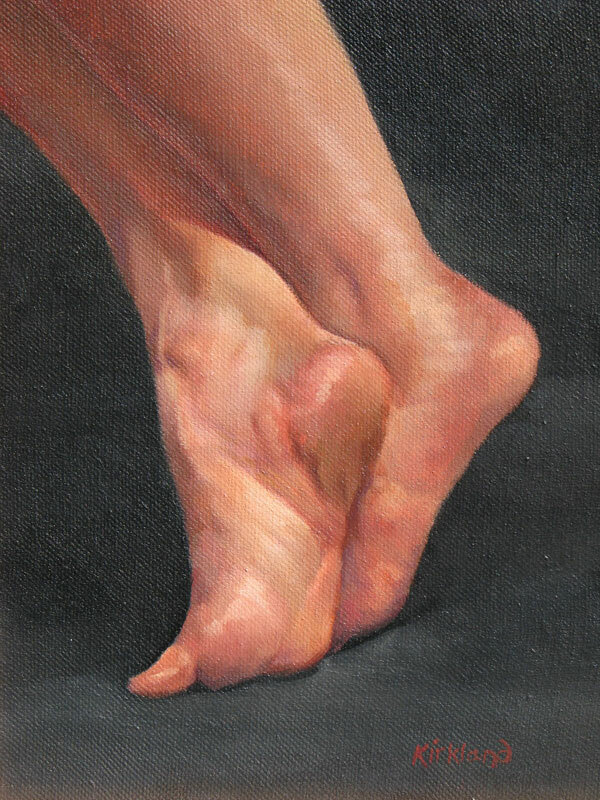 I spent every day for 2 weeks painting only the model’s feet. There is still more I could do. I did not accurately observe an area and painted it hastily, instead of really seeing the subtlety of value there. I decided to leave it that way rather than correct it so that I would always remember the lesson.